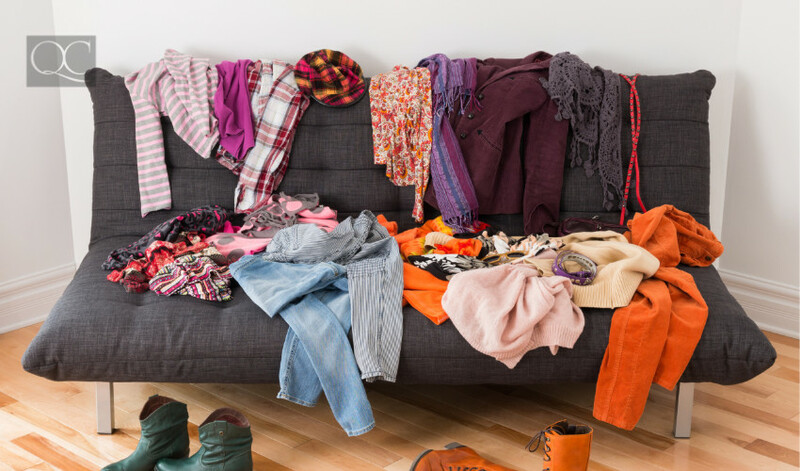 Is A Little Clutter Good For You? As a professional organizer, you’ve seen it all—balled-up pieces of notebook paper tossed haphazardly next to the trash bin, a decade’s worth of Halloween costumes hidden in the back of the closet, and stray Cap’n Crunch cereal bits crushed to crumbs on the dining room table. This sounds like a disheveled teenager’s natural habitat, but they might just be on to something. In many ways, organization can do us a heap of good. We know from experience that there’s nothing more satisfying than crossing off a task from our to-do list—but can some clutter actually be good? Studies are popping up all the time debunking claims that messiness is a sign of a disorganized mind and imminent failure. They say that a little clutter can actually spur creativity and incite out-of-the-box thinking. Sure, a cluttered space will look messy to the casual observer, but you know better. The messiest of people recognize that at the end of the day, it’s their mess, so they have a sense of control over their seemingly turbulent surroundings. If you’re unsure how to approach the clutter in your clients’ home, read on. For most people, a mix of tidy spaces and rooms of casual disarray work best. An overly clean room can make the space feel like a cold, hard, temporary settlement instead of a warm and cozy retreat from the hustle and bustle of the outside world. 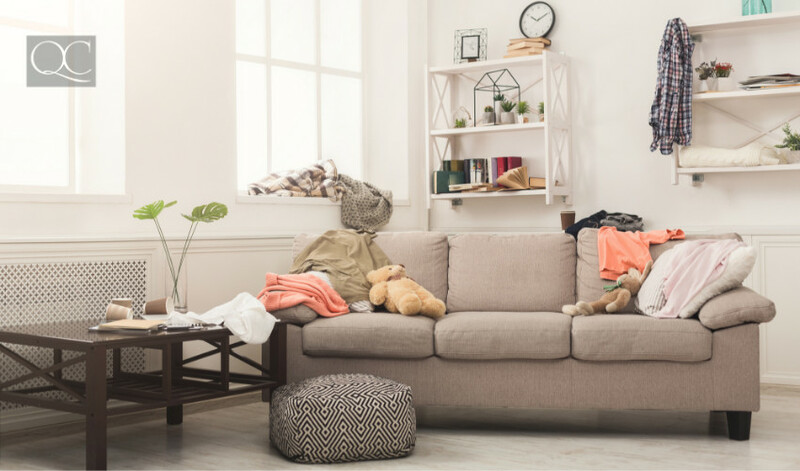 Consider how a little mess will affect these 4 commonly cluttered areas in a home. The living room is often the first big room that reflects the interests of the homeowners. 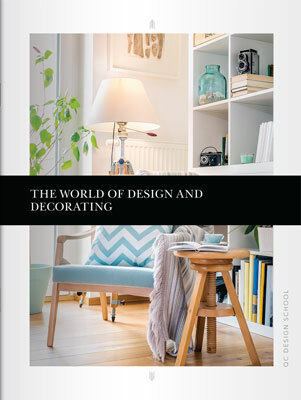 As soon as you walk in, it sets an impression for what you can (reasonably) expect the rest of the home to look like. A little bit of clutter can stimulate interest in the living space and maintain its title as the hub of family activity. Some people like to have their dinners while camped out on the sofa –not a bad way to pass the time. But it can become dirty when those dishes covered in barbeque sauce and stray bits of corn get left out of the confines of the kitchen for days. It turns into a health issue and the home goes from cluttered to just plain dirty. Everyone likes to run his or her office space differently. This all depends on his or her own unique method for getting work done. What may seem like a cluttered space to you is a sanctuary to those creative types. So long as they can find what they need and get tasks done by their deadlines, it’s not a problem. But if they’re struggling to stay on top of things, then perhaps they need to take a step back and re-evaluate their system. The desk is typically the heart of your clients’ work environment. 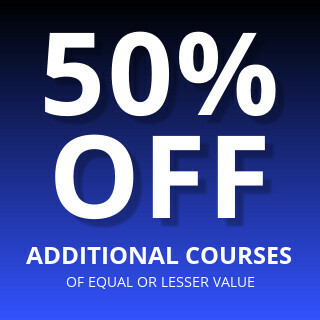 They may not be willing to admit it, but if their desk has less than 50% free space when it’s not being used, then it’ll need some tidying up. This will allow them to get work done without feeling crowded and uneasy. A chaotic bedroom will slow people down. Especially since the bedroom is where most people’s days begin and end, having such a messy space can be a discouraging sight in the mornings. 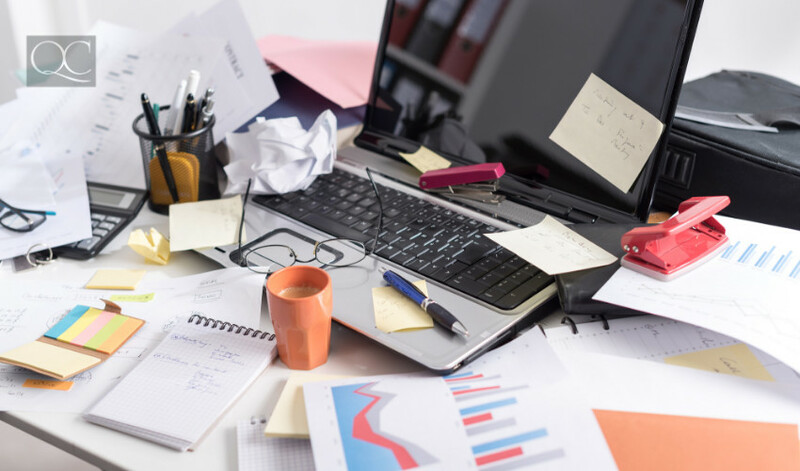 However, a little clutter straddles the fine line between a stress-inducing environment and a comfortable place where they can just drop all their stuff after a hard day’s work and relax. So long as your clients can still see the floor, and they are still motivated to get out of bed in the morning to tackle their daily tasks, they’re golden! The closet is another beast entirely. Closet clutter is inevitable. Having a busier closet can be a blessing—the pair of blue capris arbitrarily tossed on top of that Old Navy blouse can be the perfect accidental pairing. 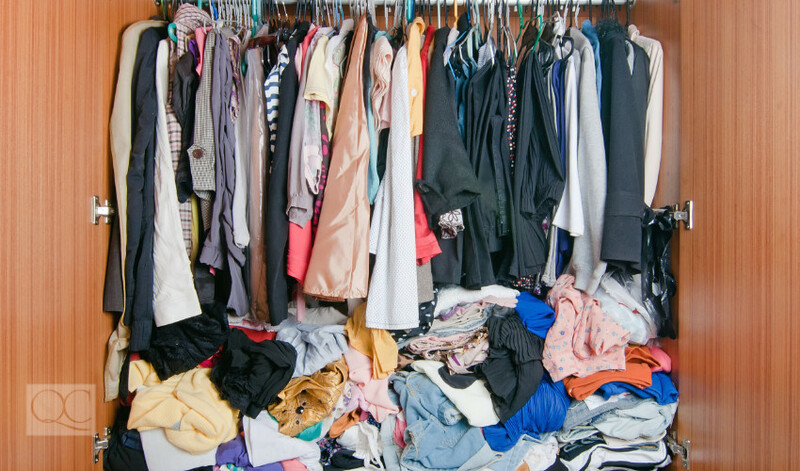 But if your clients have to keep working through their winter coats and cozy sweaters in order to get to their summer garments, then they may be in need of your professional organizing magic. Kitchens consistently facilitate the most creative projects in any home. 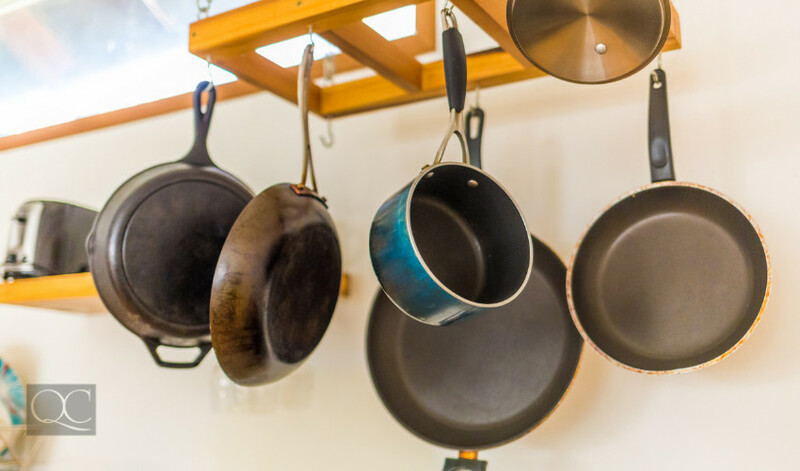 A little clutter can help get those creative juices flowing—just be sure that you know where to find the strainer at that critical moment between perfect pasta and overcooked mush. Bad clutter comes in the form of food clutter. Having some cooking instruments out can help with brainstorming different ways of re-purposing last night’s Kung Pao chicken. But having a kitchen that stays messy for days after cooking the perfect meal can create an unsafe cooking environment. If your client insists that the cookie crumbs and dried up spaghetti sauce is no cause for concern, remind them that unless they want ants or worst yet, mold and other pathogens, they should keep the kitchen tidy in terms of food stuffs. Often cabinets and fridges become crowded with expired food and rarely used ingredients. The fridge should be thoroughly inspected every so often to find expired foods or funky smelling mystery meats before they have the chance to mess with the fresh produce. Check out this post on helping your clients downsize in time for the big move!